The Meizu MX4 has a MediaTek MT6595 chipset with four high-powered Cortex-A17 2.2GHz cores and four low-power Cortex-A7 1.7GHz cores for when you need to conserve battery. The chipset can handle 4K video recording, up to 20MP camera support and has a PowerVR G6200 MP4 (quad-core) GPU. The RAM is at 2GB so overall a very respectable system. The Meizu MX4 offers a few battery modes. For the benchmarks we used the performance mode which should, in theory, give out the best results. Before we begin we tested the Meizu MX4 for cheating - the MX4 didn't cheat. The first batch of tests we perform are the CPU ones. The Meizu MX4 proved to be a very powerful performer overall but showed a poor Basemark OS II overall and single score. It topped the GeekBench 3 table with a very high result. It placed in second in AnTuTu 5 behind the Samsung Galaxy Alpha. In Basemark OS II the Meizu MX4 showed a great multi-core performance, which is the usual for eight-core chipsets but poor single core and as a result overall score. The graphics tests show a different story, though. The Meizu MX4 and its PowerVR GPU we unable to move past last or semi-last place in every test we performed. Both GFXBench's 1080p tests proved difficult for the MX4. It got consistent results in the offscreen and onscreen 2.7 T-Rex and 3.0 Manhattan tests but very far from the top performing Apple iPhone 6. The Xiaomi smartphones got a consistent fps lead over the MX4 as well. Basemark X is a gaming benchmark that gives an overall score based on many tests - rendering, fps, etc. 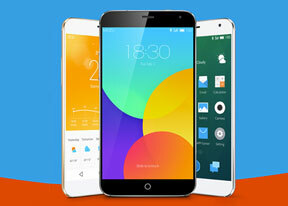 The Meizu MX4 bottomed out in this test and was way behind its direct competition. Perhaps Meizu didn't optimize the GPU to its full potential, but we're only guessing. The Meizu MX4 failed to impress here too. In Kraken 1.1 it got worse results than all of its rivals and in BrowserMark 2.1 showed consistent results with its peers from Xiaomi. What you need to take away from these tests is that the Meizu MX4 has a very capable CPU and only average GPU and browsing prowess. In practical situations though the MX4 feels speedy and capable. We didn't experience any hiccups, pages loaded just fine and animations were smooth throughout the system. The MX4 can handle tasking games as well, it just won't be as fast as an Apple iPhone 6 or any of the leading Android smartphones but the difference won't be drastic in any case.